Summary: Pirates and fans celebrate "Earth Day." 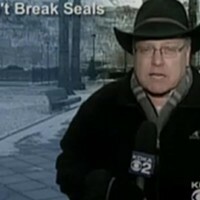 Reporter: David Hall, KDKA Channel 2 Airtime: 1 minute, 59 seconds on April 22 Highlights: * When anchor Stacy Smith announces, "Today is Earth Day, a day advocates say should be used to appreciate and to focus on the environment -- and the Pirates are doing their part as the team takes on the Milwaukee Brewers this afternoon." * When Hall reports, from outside PNC Park, "This Earth Day fits into the Pirates year-long 'Let's Go Green, Let's Go Bucs' campaign, where the team tries to make a difference." * When we switch to Hall's prerecorded portion of the segment: "It's game day for the Pittsburgh Pirates, but there's a different kind of energy and activity taking place outside of PNC Park." You can say that again. * When Pirates chairman Bob Nutting explains, "The Earth is something we all need to respect and take care of for future generations. It's something we can all do, little bits every day ..." * When the member of a volunteer group from Academy Charter School explains a winning strategy for clean-up -- one the Pirates might want to pay heed to: "We decided it worked better if we could stick as a group, and hit one area at a time, rather than one person wandering around a large area." * McClenahan's inventory of the garbage: "a lotta beer cans and bottles, wrappers, cigarette butts, Styrofoam cups, fast-food bags." * When Hall interjects, "Not only are they helping out the world, but their neighborhood." * Back to the live shot, when Hall tells us, "Fans who attend today's game will receive 'Let's Go Green, Let's Go Bucs' T-shirts, and also, green, recyclable PNC caps. You can't beat this." Well, at least that's something the Pirates have that you can't beat. What We Learned: Nutting seems to have all the answers for saving the Earth. I would like to hear his answers for saving his team. Unanswered Question: So ... when Pirates batters don't score a single run, it's all in the name of energy conservation? News Value: 4. Watching this story after knowing the Pirates lost 20-0 was tragically funny. Too bad Pittsburgh celebrated Earth Day by letting the Brewers light up the scoreboard. But to the volunteers who cleaned up that day -- and every other day -- I say "thank you."